Many of the women we care for at the Women's speak little or no English. The Women's is committed to helping you communicate with our staff so that you can make your own decisions about your healthcare. An interpreter makes sure that your diagnosis and treatment are explained in your preferred language so that you can ask questions and understand the information you are given. The Women’s provides experienced interpreters for every hospital clinic and service. We provide assistance with over 80 community languages. 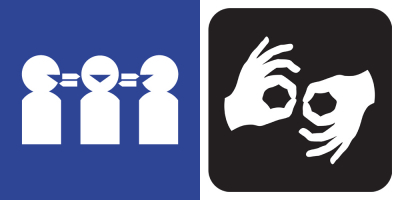 We also provide services for women requiring an AUSLAN (Australian Sign Language) interpreter. Our interpreters understand the importance of interpreting accurately and impartially and keeping all information confidential. 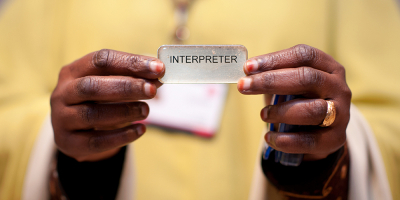 Interpreters are available to all patients at the Women’s who need the service. The Women’s provides interpreter services 24 hours a day, seven days a week. AUSLAN interpreters booked from external agencies. Bookings must be made preferably seven days prior to appointment. Our interpreters specialise in women's health terminology and are familiar with women's health issues and medical treatments. Family, friends, carers and husbands should not act as interpreters at appointments. You are welcome to bring your husband, partner, relatives or friends for support at your appointments. However a trained interpreter must be used to ensure that you understand the information, procedures or surgery that are discussed with you. With the assistance of a qualified interpreter the health professional will be able to understand your questions about your care. Family members or friends can be used to assist communication only as a last resort - but nobody under the age of 18. If you have a Medicare Card, the use of the interpreter is free. If you do not have a Medicare card, the interpreter fee will be included in the cost of your appointment at the Women’s. If you want to make sure that an interpreter will be at your first appointment, you can ring us a week before your appointment and we will check if an interpreter has been booked. If an interpreter has not been booked for you already, we can organise one for you. You can also request an interpreter if you make an appointment at the hospital yourself. If you are unable to attend your appointment at a clinic, or need to change the time, please contact the clinic as soon as possible so that another appointment can be made for you. Please tell the clinic if an interpreter has been booked for you and they will cancel the booking with us. If a face-to-face interpreter or a telephone interpreter is not available in the State of Victoria we can contact other states of Australia to book a telephone interpreter. We can provide interpreters for every clinic and service. Your doctor/GP should inform the Women’s that you will need an interpreter for your first visit.